San Francisco Real Estate Agent | Cece Blase | Does anyone else remember the Wild Mouse ride at Santa Cruz Beach Boardwalk? Does anyone else remember the Wild Mouse ride at Santa Cruz Beach Boardwalk? When I was a kid it was the only ride there I didn’t like. My hip sockets always took a beating in those tiny metal cars, and I never walked away without bruise or two along my swimsuit line. The 2018 real estate market in San Francisco is delivering a similar ride with buyers feeling battered by multiple offers and upward tilting prices. Sellers, on the other hand, get to enjoy the adrenalin rush of embarking on a great adventure that in all likelihood will end safely. But the thing with a carnival ride is that you never know what lies beyond the next turn. After a white hot winter and spring, the market has tempered a bit, leaving all of us to once again to wonder whether this is a seasonal slump or the beginning of a broader trend. On an anecdotal level, we are seeing more price reductions, and our mortgage broker friends are telling us applications are way down. 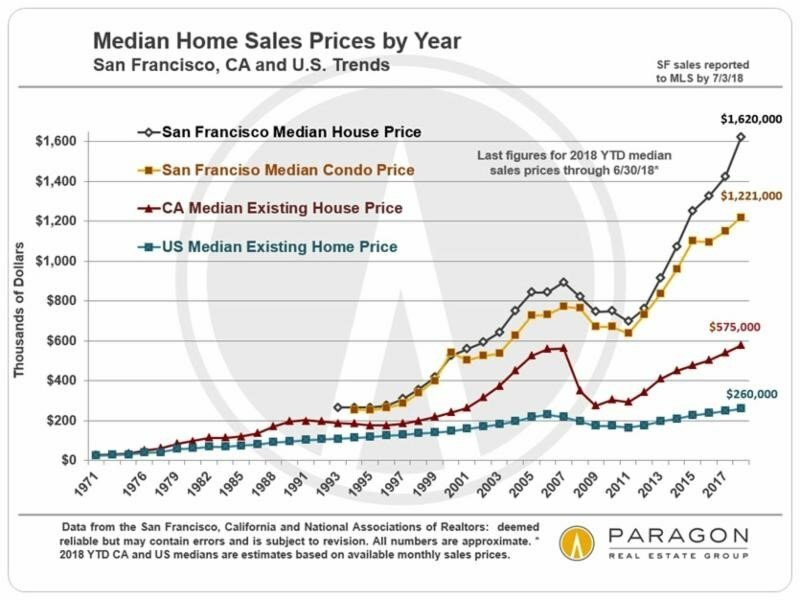 On the other hand, demand remains robust for certain market segments– like single family homes in “starter” neighborhoods like the Excelsior or Portola Districts, or the sub $2M market for houses in more expensive neighborhoods like Noe Valley or Dolores Heights. The chart here the dips and dives over the years and the most recent ascent. Doomsdayers say we are in for a drop in the market, but it’s also possible that we’ll just scoot around way up high just the way the Wild Mouse did. View the full size chart here.